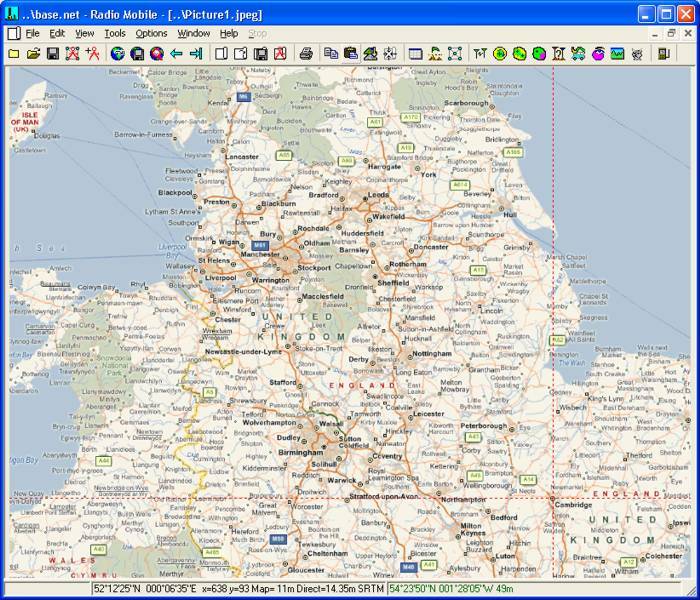 Map centre coordinates can be obtained directly from 'Google Earth' cursor position when viewing your location, for direct entry into Radio Mobile. But for 'local' movement of the map area read on. For large movements of position click here. Use of the City names. To re-centre a map to a point which is visible on it, all that is required is a 'double click' at the required location. This opens the Map Properties pane with its existing size and height, but with the new centre coordinates entered. An 'Alternate World map' feature is available in RM which can also be used as in Use of the alternate World map. As an example of a local 'longer distance' map centre location change, (from the Peak District to Cambridge), the Map Properties pane of the Base Network has been opened ('File/Map Properties'). In this, the map height has first been changed to 300km. 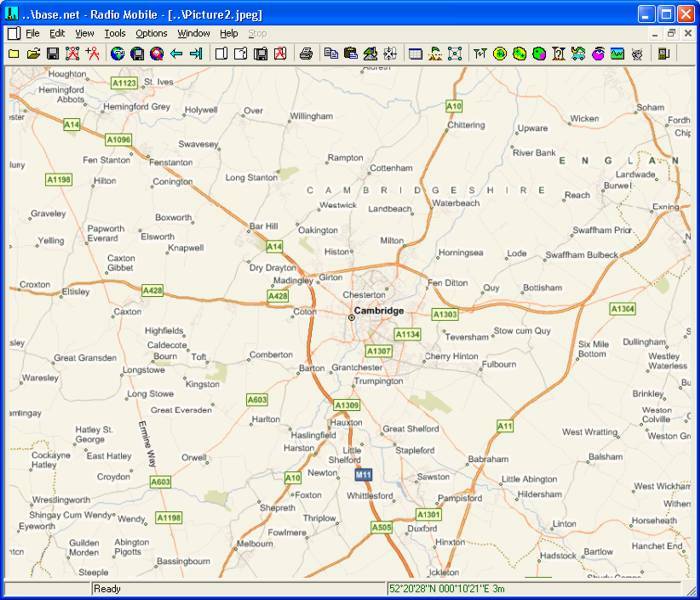 The cursor can be seen placed on 'Cambridge' with a click on its location, and this location will be used as map centre in the Map Properties pane by clicking on the 'Use Cursor position' button. Alternatively, as above, a double click will also open the map properties pane, but the map height has also been returned to 30km. A click on 'Extract' once more then produces the designated area map. and a road map, produced by a 'Merged/copy' - and 'kept in new picture', can be used to check the location is as required. The Map, Map Picture and Road map of the new location may then be saved under New Names. Unwanted pictures should be closed, the Map picture may be modified by addition of contours - possibly 'merged/multiply' with a greyscale version of the road map, and saved as shown. After Units have been placed on the area the Network can also be saved. But also see the Alternate World Map! 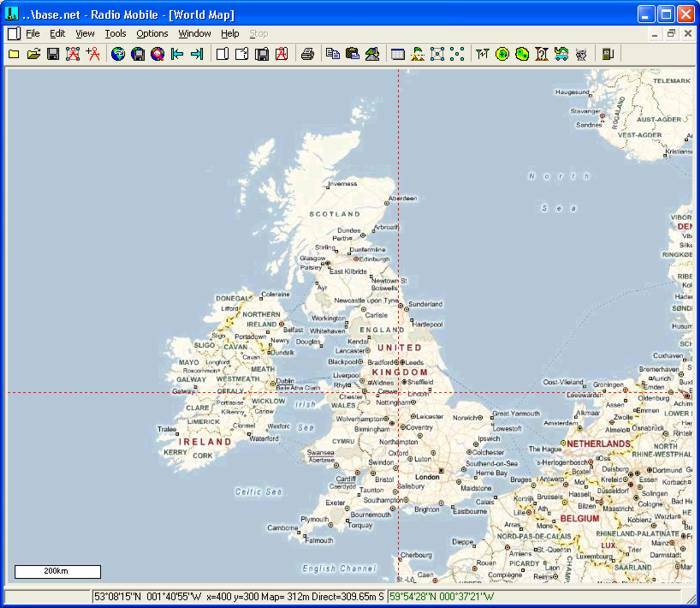 For stations located outside the UK, once you have installed the 'Base Network', it is very simple to change the map location to your area of the world. 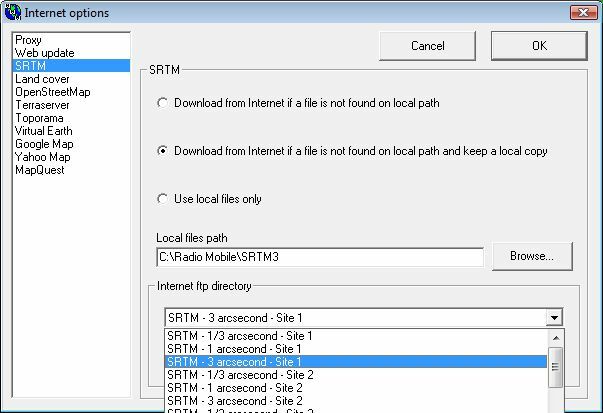 The Internet options pane has been set as shown to 'Site 1' for 3-arcsecond tiles - there are four alternative sites available if that server is unavailable which can be selected from the drop down list shown. There is no need to select a world region as the servers all contain complete sets of available data. Open the 'Map Properties' pane (F8) where you can select your local City name from the drop down list after clicking 'Select a city name' button. 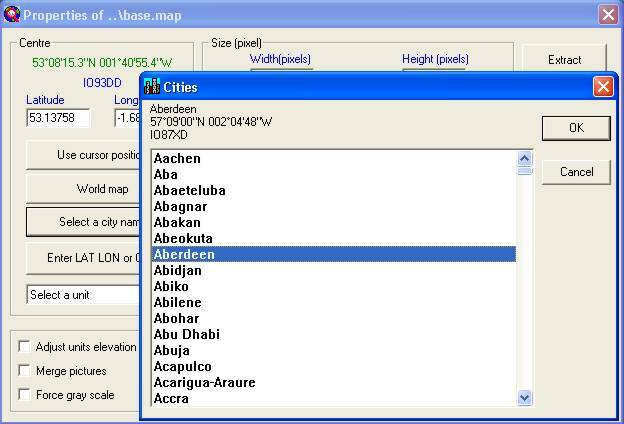 A City can be selected by typing the first few letter of its name, or by a click on the name in the list after using the scroll bar, then 'OK' or 'Enter' will enter its Latitude and Longitude co-ordinates as the new map centre position. For direct location entry, you can enter Lat/Long or QRA data by using the appropriate buttons. Your exact location can be found by viewing your area in Google Earth, and then making a note of the cursor coordinates for entry into Radio Mobile using the 'Enter Lat Lon' button. 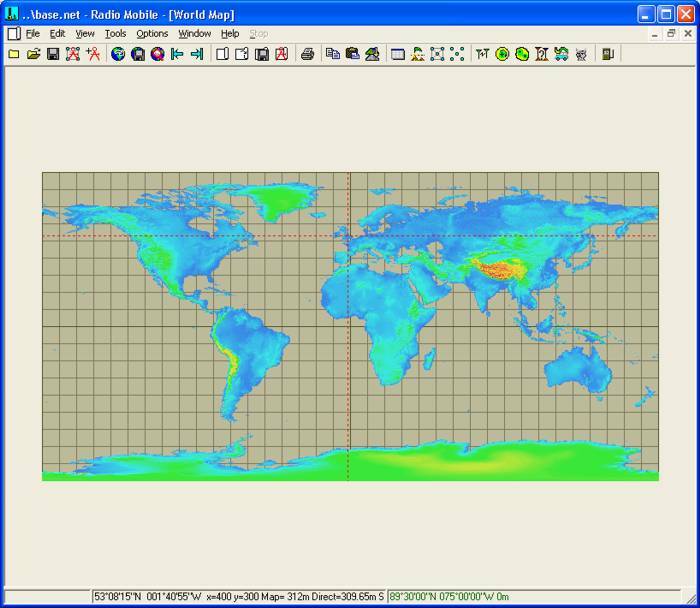 This causes the display of a World Map with the cross wire cursor at the centre of the existing map location, a 'Double click' on any location will open the Map Properties pane with that cursor location entered as map centre. 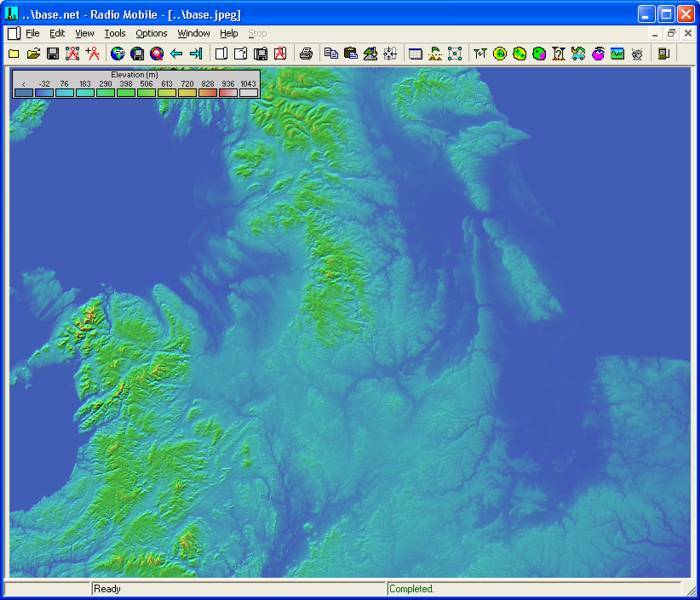 As an additional feature it is also possible to save your local country overview map under the name of 'Wmap' in *.bmp or *.jpg format in the RM directory root as an alternate initial World Map display - the map being displayed can be toggled to the World view using 'View/Swap World map' command. This enables the quick re-centring of map areas with a double click of the mouse. The alternate World map shown below is one I have generated for the UK, and is available in my Base Network - and also from my Downloads page. This map can be replaced to show your own local area of interest by changing Wmap.jpg (or to Wmap.bmp) and Wmap.dat to your own generated files. 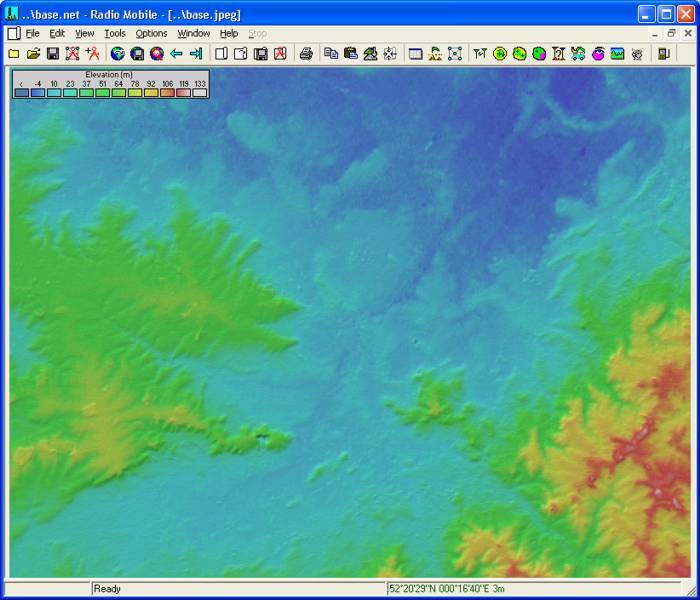 This is achieved by displaying a suitable map of your own area of interest, then saving it as 'Wmap' in the root of the RM folder to replace my existing files. 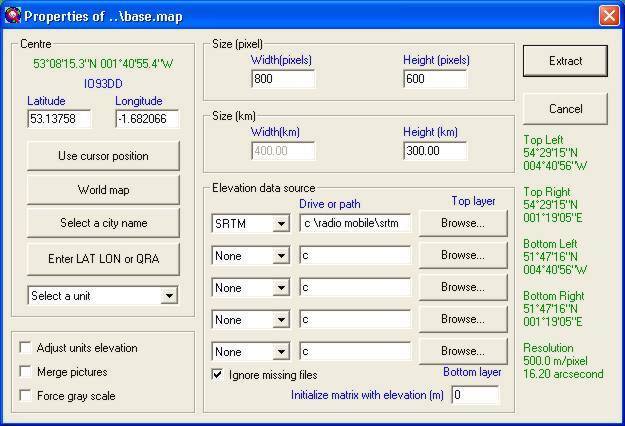 Finally, the map height and size can be changed to suit your requirements. 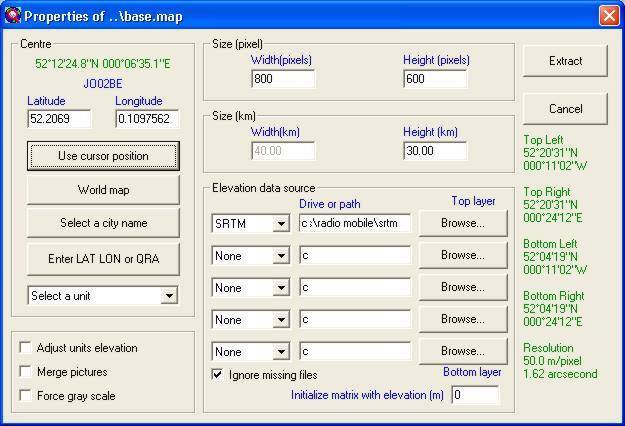 Clicking 'Extract' will then cause a new map to be drawn - but it will be elevation data only. To add road details a road map needs to be downloaded using 'Merge' set to 'Copy' and then 'Kept in new picture'. This picture then should be modified to greyscale using 'Edit/Force greyscale' and then using the Merge function whilst displaying the elevation map select the source as 'Another picture' - set to 'Multiply' - and select your greyscale road map followed by 'Draw'. Any Legends can be redrawn and the modified map picture saved for use.